TK Retail Design are one of the UKs leading designers and developers of shop premises. With decades of experience, and having created over 700 retail outlets, Turn Key Retail Design offer the complete package, from concept to completion, for any retail client. TK Retail Design partners include sportswear companies, book sellers, food retailers, cafes and restaurants. When it comes to designing and creating retail premises there are some common criteria – negotiating with landlords, gaining planning permission, incorporating stock and storage space – but there is also the requirement to be product specific and to be fully aware of the client’s own brand and image. Take, for example, the design of Coffee Shops. The Coffee Shop culture has developed swiftly over the past ten years and yet it retains a link with the first UK coffee shop, opened in London in 1668. A coffee shop is a meeting place, a focal point, a chance to relax and an opportunity to regroup and regain strength. It is the place to swap ideas and stories and it is a place to do business. A coffee shop must be warm and inviting. Quiet enough to talk but not so quiet as to be overheard. And every coffee house must have its own charm and its own ambience. TK Retail Design have worked with a host of cafe companies to design and create some of the most successful coffee shops in the UK today. 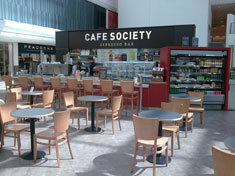 Café Ho-Sete in the Belfry Centre, Surrey, is a stand alone mall coffee shop, viewable from 360° from the main concourse. This TK Retail Design project was so successful another was created for Café Ho-Sete in the Arndale Centre, Eastbourne. Café Society in Southend, Bean And Bud specialist tea shop in Harrogate, Café Milano in the south of England are other examples of hugely successful partnerships with Turn Key Retail Design.